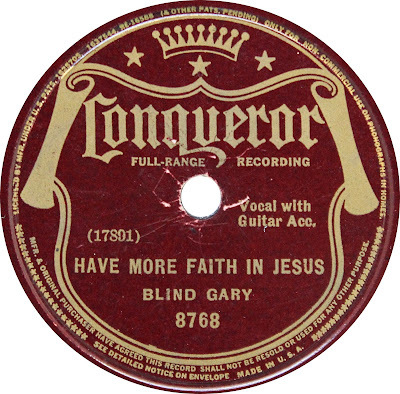 Reverend Gary Davis, also Blind Gary Davis, (April 30, 1896 – May 5, 1972) was a blind African American blues and gospel singer and guitarist, who was also proficient on the banjo guitar and harmonica. Gary Davis was born in the Piedmont region of the country, in Laurens, South Carolina, and was the only one of eight children his mother bore who survived to adulthood. He became blind as an infant. Davis reported that his father was killed in Birmingham, Alabama, when Davis was ten, and Davis later said that he had been told that his father had been shot by the Birmingham High Sheriff. He recalled being poorly treated by his mother and that before his death his father had given him into the care of his paternal grandmother. He took to the guitar and assumed a unique multi-voice style produced solely with his thumb and index finger, playing not only gospel, ragtime, and blues tunes, but also traditional and original tunes in four-part harmony. In the mid-1920s, Davis migrated to Durham, North Carolina, a major center for black culture at the time. 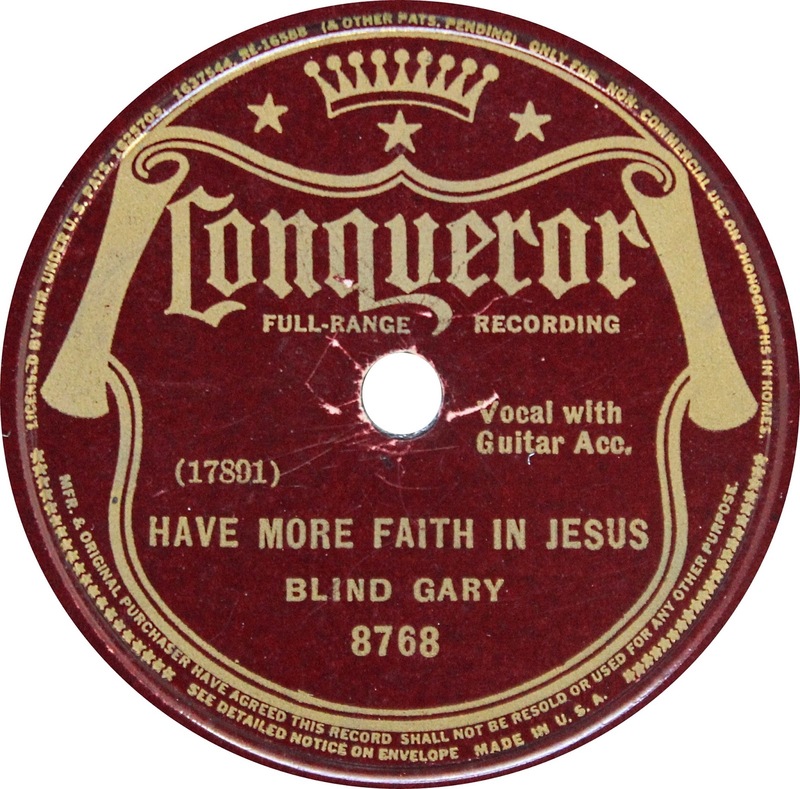 There he taught Blind Boy Fuller and collaborated with a number of other artists in the Piedmont blues scene, including Bull City Red. In 1935, J. B. Long, a store manager with a reputation for supporting local artists, introduced Davis, Fuller, and Red to the American Record Company. The subsequent recording sessions marked the real beginning of Davis' career and are available in his Complete Early Recordings. During his time in Durham, Davis converted to Christianity; in 1937, he would be ordained as a Baptist minister. Following his conversion and especially his ordination, Davis began to express a preference for inspirational gospel music. In the 1940s, the blues scene in Durham began to decline and Davis migrated to New York. In 1951, several years before his "rediscovery", Davis's oral history was recorded by Elizabeth Lyttleton Harold (the wife of Alan Lomax) who transcribed their conversations into a 300+-page typescript. The folk revival of the 1960s re-invigorated Davis' career and included a performance at the Newport Folk Festival and having Peter, Paul and Mary record his version of "Samson and Delilah", also known as "If I Had My Way", which is originally a Blind Willie Johnson song that Davis had popularized. "Samson and Delilah" was also covered and credited to Davis on the Grateful Dead's "Terrapin Station" album. Eric Von Schmidt credits Rev. Davis with three-quarters of Schmidt's Baby, Let Me Follow You Down which Bob Dylan covered on his debut album for Columbia. Blues Hall of Fame singer and harmonica player Darrell Mansfield has also recorded several of Rev. Davis' songs. Davis died in May 1972, from a heart attack in Hammonton, New Jersey. He is buried in plot 68 of Rockville Cemetery in Lynbrook, Long Island, New York. 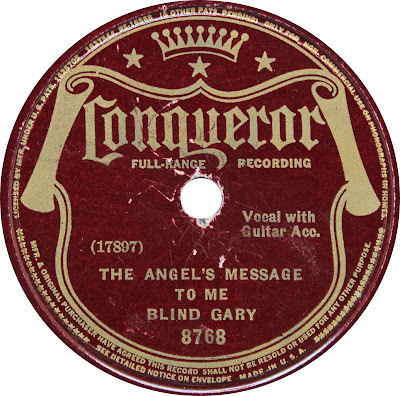 Recorded in New York on July 26, 1935.